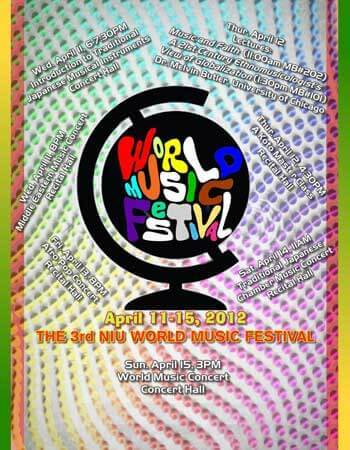 The NIU School of Music will host its third annual World Music Festival from Wednesday, April 11, through Sunday, April 15. NIU’s own Middle Eastern Music Ensemble, a student group led by two Syrian-born musicians, Aboud Agha and Omar al Musfi, will kick off this year’s festival by performing Pan-Arabic art, folk and pop music in a concert at 8 p.m. Wednesday, April 11, in the Recital Hall. At 8 p.m. Friday, April 13, the newly established NIU Afro Pop Ensemble led by internationally known Afro pop singer Mathew Tembo will take the baton in this relay to give its first full-length concert appearance in the Recital Hall. A Japanese guest group featuring musicians on traditional Japanese instruments will perform a concert at 11 a.m. Saturday, April 14, in the Recital Hall to introduce several Japanese instruments: the koto (zither), shamisen (lute) and shakuhachi (end-blown flute), both in their traditional cultural context and an innovative contemporary setting. In addition to the concerts, a lecture/demonstration on Japanese traditional instruments will take place at 6 p.m. Wednesday, April 11, in the Boutell Memorial Concert Hall. Ethnomusicologist Melvin Butler of the University of Chicago will speak on the topic of “Music, Nationalism, and Spiritual Warfare in Haiti” at 11 a.m. Thursday, April 12, in Music Building Room 202. At 1:30 p.m. that day, Butler will lead a discussion in Music Building Room 101 on the ethnomusicologist’s role in the globalized era. A joint master class on koto with UIUC’s koto studio (appearing via Internet 2) will be given at 4 p.m. Thursday in the Recital Hall. The World Music Festival will conclude at 3 p.m. Sunday, April 15, in the concert hall with the annual World Music Concert, highlighting several world music performances. Two guest ensembles representing East Asian musical practices will be featured: the Japanese Chamber Group from Tokyo and the Chicago area Cheng-Da percussion ensemble. They will share the concert hall stage with NIU’s own student ensembles. The Chinese Music Ensemble, the Indonesian Gamelan Ensemble, the Middle Eastern Music Ensemble and the Afro Pop Ensemble will showcase the very diverse music curriculum at NIU, a celebrated tradition since the 1970s.